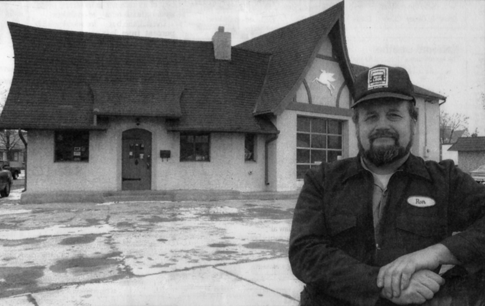 History | R & L Repair, Inc.
Ron Geiselhart, R&L Repair, stands in front of his shop at 1735 West St. Germain St. The building has been there since 1927. Cars still flock to the half-timbered stucco building with its familiar flying horse and chalet-style roof. But these days it’s specialized repairs their owners seek at 1735 West St. Germain, not the full-service gas fill-up the late Jack Simon offered for 37 years at his nostalgic red-and-white Mobile station. That mom-and-pop era has passed for this once bustling intersection of St. Germain that used to sustain four gas stations. Two of them were removed for the Wendy’s fast food restaurant along Division Street. One has become a small office building. As a boy, Simon would watch as people would keep going into the tiny station without it getting crowded, he recalled in an interview before his death 11 years ago. “Long before Jack had it, it used to be used as a speakeasy,” said his wife, Ruth Simon. Customers could find bootleg whisky during the Prohibition by going into the dark basement, which was carved out all the way to the edge of St. Germain at the time. There was a little door they’d have to duck through, then another with a sliding peephole, she said. There was also an escape door level with the street in case the police came. Current owner Ron Geiselhart remembers similar stories from other gas stations and repair shops where he worked. At one in Fairmont. he was told the servicemen would slip a bottle under your seat while they whisked the floormats clean. He also remembers working at a St. Cloud gas station with a liquor still beneath it. The station at 1735 West St. Germain is one of the few remaining in the St. Cloud area. Some have found new uses like the Vacuum Cleaner Center on Division Street, and a couple of them are still operating. The former Jack’s Service Station is notable for its quaint cottage-style that helped it blend in with the near by neighborhood. 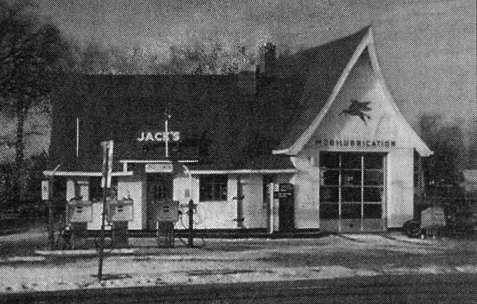 Jack’s Service Station operated from 1942 until 1979 at 1735 West St. Germain. Geiselhart often gets favorable comments from people who’ve noticed his shop called R&L Repair. “You have that cute building with the horse on it,” they’ll say. The Mobil Pegasus, in particular, has garnered a lot of attention – especially from folks with soft spots for gas station collectables. “Lots of people have tried buying it, but it’s not for sale,” Geiselhart said. He and his wife Laurie (the “L” in R&L Repair) collect antiques, so they know the value of the piece – beyond being fond of it. A Mobil representative made him alter the red horse. He chose to paint it white rather than remove it. It blends with the light tan and dark orange building. The gas station was originally built in 1927 by Archie Hirt for $3,000. It was known as St. Cloud Oil and Grease Company until 1930. There were other owners in those early years when the station had no garage for repair work. They created a pit that cars could be driven over so they could work underneath them. Based on the dates of newspapers insulating the windows in the stations original garage, Geiselhart figures that part was built during World War II. It would have been about the time Simon took over in 1942. Simon worked seven days a week up to 16 hours a day, pumping gas, fixing brakes, changing tires, putting in new spark plugs and oil, doing the books and keeping his shop orderly. “I think it was the cleanest station in town,” his wife said. At that time a customer could get 9 gallons of gas, clean windshields and oil and tire checks for just $2. Simon’s health, escalating gasoline prices, stricter environmental requirements and the onset of competition from large highway gas stations led to his retirement and the closing of the longtime St. Germain station. Geiselhart was its next operator; drawn to its manageable size that fit his shoestring budget. He has tried to preserve the station’s unique look, despite the absence of pumps and the need to add another garage for repairing today’s bigger vehicles. It’s a tribute to a bygone era where there was time for a friendly chat with an attendant who cleaned your windows and handed out candy to kids. “We tried to keep the same design,” Geiselhart said. McClintick, Lisa. “Quaint Shop once sold bootleg whiskey.” St. Cloud Times (09 Mar. 1999).